Since we have been so busy this SPRING BREAK already, we are taking a day today to SPRING CLEAN and spruce up our yard work. PLUS...we have all the kids together for the Easter weekend, which is a HUGE TREAT! No products were sent for this feature! I was not offered any monetary compensation by posting my honest opinion about the product I am featuring as a SPRING BREAK TREAT! We made Beignet's from Cafe Du Monde. 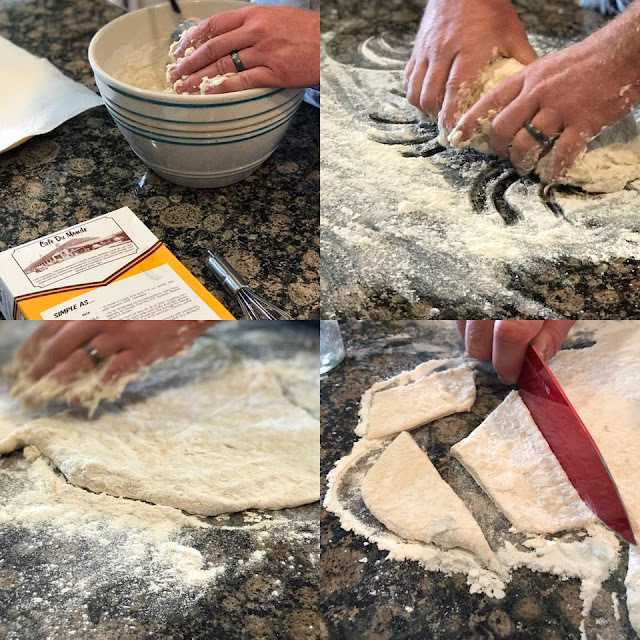 Since we clearly cannot take our HUGE family of eight to enjoy some freshly made ones in Louisiana this morning...we made some from the comfort of our own kitchen. It was a team effort! My husband and I make an AWESOME TEAM in the kitchen together. 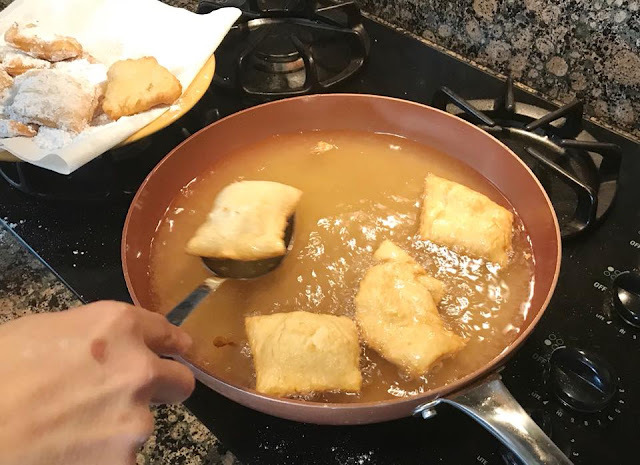 As he cut the dough, I fried the dough and powered those babies up with lots of sweetness. YUMMY! Despite a tiny mess on our kitchen counter...these are super easy to make and they taste SO GOOD! Clearly, they are not "CUT" to perfection, but our kids didn't seem to mind what shape their beignets were in. They enjoyed the "FRENCH DOUGHNUTS" covered in powdered sugar. You would too, right? One box makes about 48 Beignet's, which was plenty for our family of eight. I also made some bacon and eggs to make this a little bit "healthier" breakfast choice. HA HA! Beignets were also brought to Louisiana by the Acadians. These were fried fritters, sometimes filled with fruit. Today, the beignet is a square piece of dough, fried and covered with powdered sugar. They are served in orders of three. 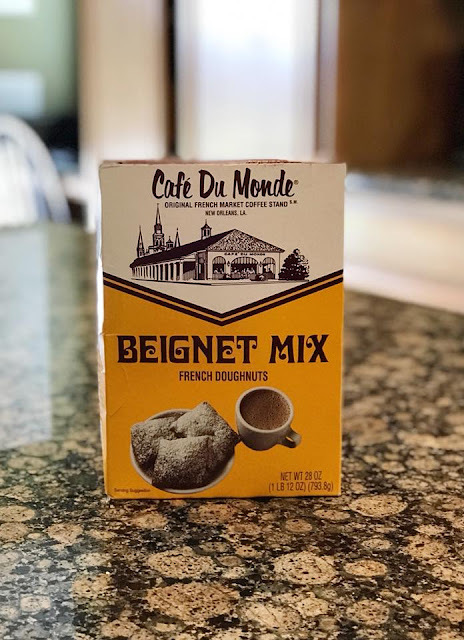 CLICK HERE to order some for your family, straight from LOUISIANA...and enjoy this French Doughnut Treat with your kids! It's an experience they can enjoy without the cost of the travel. THEY WILL LOVE IT! I was not paid to feature this post! 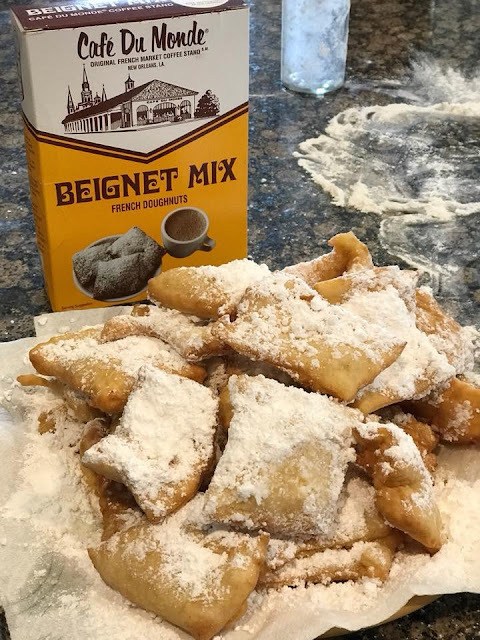 I was not compensated in any way by posting about us making Beignet's for breakfast for our kids from the Cafe Du Monde market. 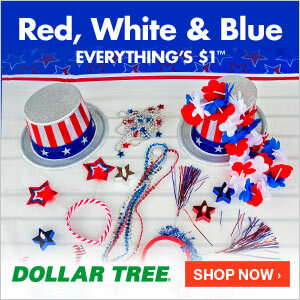 We purchased this from their online store.